The Motic BA210 Series is built for exceptional optical performance and the high-resolution needs of colleges, universities and medical school markets. The BA210 series features a reversed quadruple nosepiece and built-in Koehler illumination as standard equipment. 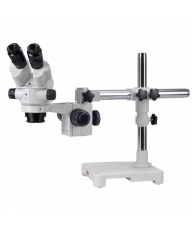 It also incorporates a fully rotating, 30-degree inclined binocular or trinocular siedentopf viewing head with 10X widefield eyepieces, 53mm to 72mm of interpupillary adjustment and individual diopter adjustment for each ocular tube. 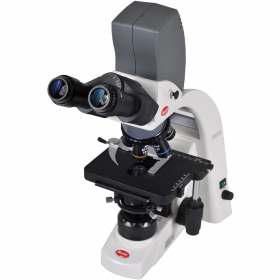 Available in Halogen or LED illumination, this new microscope series brings versatility and ergonomics to a wide range of education and professional applications. The optical system is designed around a new generation of Color Corrected Infinity System EF-N Plan Achromatic objectives (4x, 10x, 40xS and 100xS Oil). These new lenses are multilayer-coated for improved contrast and image enhancement, rewarding student efforts with clear visual and digital results. The bi-lateral focus controls allow finger touch adjustment while the dimmer switch is conveniently located next to the right hand control. The stage and focus controls can be operated during 'eyes down' observation. Safety features include a rack stop to ensure that the stage does not impact and damage the objectives or slides, and a slip clutch minimizes the risk of damage due to over-extension. The condenser is a professional focus-able Abbe 1.25 NA with iris diaphragm and filter for optimal adjustments. 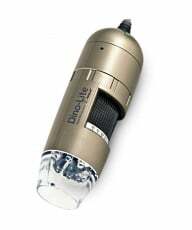 Higher quality Koehler illumination is powered by 6V 30W halogen with variable intensity. 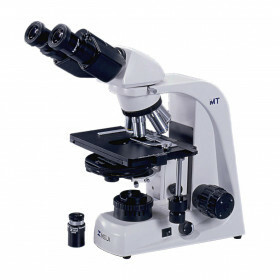 SALE IS FINAL ON LAST REMAINING MICROSCOPE ON SALE AT SPECIAL PRICE. 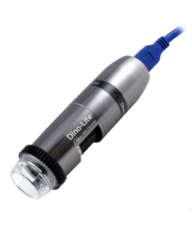 The Motic BA210 Series is built for exceptional optical performance and the high-resolution needs of colleges, universities and medical school markets. The BA210 features a reversed quadruple nosepiece and built-in Koehler illumination as standard equipment. 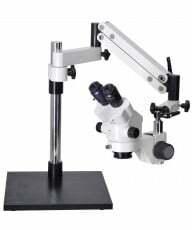 It also incorporates a fully rotating, 30-degree inclined binocular or trinocular Siedentopf viewing head with 10X widefield eyepieces, 53mm to 72mm of interpupillary adjustment and individual diopter adjustment for each ocular tube. 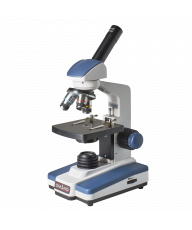 Available in Halogen or LED illumination, this new microscope series offers versatility and ergonomics to a wide range of education and professional applications. The optical system is designed around a new generation of Color Corrected Infinity System EF-N Plan Achromatic objectives (4x, 10x, 40xS and 100xS Oil). These new lenses are multilayer-coated for improved contrast and image enhancement, rewarding student efforts with sharp visual and digital results. The dual coaxial focus controls allow finger touch adjustment while the dimmer switch is conveniently located next to the right hand control. The stage and focus controls can be operated during 'eyes down' observation. Safety features include a rack stop and slip clutch to minimize the risk of damage from over-extension. The condenser is a centering and focus-able Abbe 1.25 NA with iris diaphragm and filter for optimal adjustments. High-quality Koehler illumination is powered by 6V 30W halogen or 3W LED with variable intensity.